By Julia Willerton, et al. IB Psychology is a varied and demanding qualification - you need to be independent, inquiring and knowledgeable. But finding your way around the huge amounts of research in Psychology and relating them to your exams can be daunting. So that's why we consulted IB teachers and examiners around the world and created a comprehensive guide to all the topics, themes and evaluation techniques you'll need. Inside you'll find loads of features that get you to grips with the IB syllabus requirements. 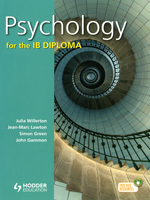 The authors are all expert researchers, teachers and examiners in Psychology, so you can be sure topics and studies are explained in enough depth for top marks as they guide you through everything you'll need for the IB.